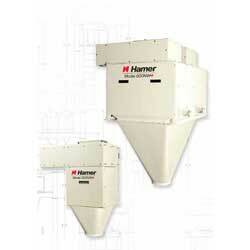 Hamer-Fischbein products offer the best in engineered automated packaging products and solutions for our customers. Their market-driven products and services lead the bagging automation industry. Diverse user groups, some of which include: Animal Feed & Supplements, Ice, Chemicals, Minerals & Mining, Fertilizer, Concrete & Cement, Horticultural and Agricultural Seeds, find that nothing compares in performance, durability, speed, and quality to Hamer-Fischbein. From simple stand-alone packaging equipment to complete bagging systems, Hamer-Fischbein offers the bagging options to meet any plant’s requirement. The Hamer Model 100GW high-speed gross weigh bagging scale with (Center Grip Bag Clamp), brings true high-speed, high-accuracy weighing to gross weigh scales and offers outstanding performance in a small, easy-to-use package. A semi-­automatic scale built of carbon steel or stainless steel, the 100GW (Center Grip Bag Clamp) utilizes a single pneumatically controlled, gravity feed gate and provides bulk fill or bulk/dribble fill for more accurate weighing. Dual load cell design improves accuracy, ensuring no off-center loading. The pneumatic bag clamp has a view window so operators are certain the bag is properly positioned each time. The 100GW will automatically discharge the bag when full, or use the auto bag hold to keep the bag in position for manual release. Minimum bag width – 8 inches. 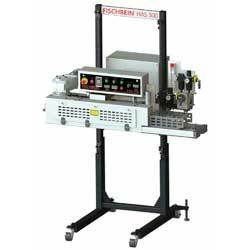 The Fischbein Model HAS 300™ Hot Air Sealer is a high-production sealing system that efficiently closes a wide range of heat sealable pillow-type and gusseted bags at up to 60 linear feet per minute. Easily adjustable controls for the heaters, air flow, and carry through belts ensure consistent, sift proof sealing for a variety of bag sizes and thicknesses. There are NO BANDS required to seal gusseted bags, eliminating related maintenance cost and downtime. Simple feeding and dosing system designed specifically for root vegetables. Automatically feeds and dispenses from 20 to 100 pounds of produce, or paper, mesh, burlap or poly bag using a staggered, cleat style feed belt. Operator hangs bag on a pneumatic clamshell style bag clamp. When bag is placed the feed conveyor belt is started. Belt speed slows when the bag is with in two pounds of desired weight when predetermined weight is attained, belt stops and pneumatic clamp closes, automatically catching and holding in-­‐flight product. 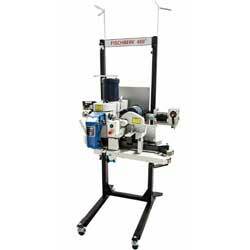 The Fischbein Model 400 NS™ sets the industry standard for quality and cost-effective bag sewing. Operating at adjustable speeds up to 55 linear feet per minute, the Model 400 NS™ features an air thread pusher which directs the thread into the system’s cutting knife. A safe automated infeed system automatically guides the top of the bag through the entire bag sewing process. The Hamer Models 600NW+ and 200NW+ are the only net weigh fillers available that offer combined high speed and high accuracy performance. These enhanced technology scales set a new standard for net weigh filling. 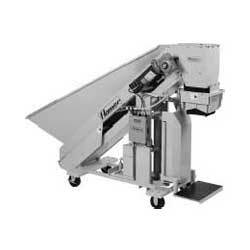 The Hamer Model 4000 Upright Bag Conveyor is a smooth-­‐surface conveyor with a mechanical splice. 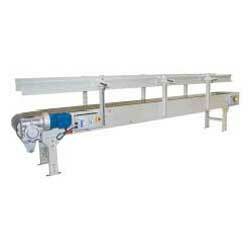 This bag handling conveyor is used when hand-­‐bagging with a volumetric filler, net weigh or gross weigh scale. 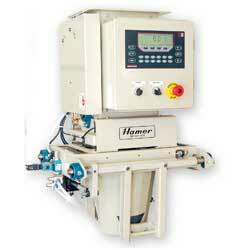 It keeps bags in an upright position and automatically moves them into position to feed into a bag-­‐top sealer. Used with a wide variety of manual bagging operations, the Model 4000 is offered in a variety of lengths and conveyor heights. Adjustable legs for top of belt height. For applications using a range of bag sizes, from 3-­‐5lbs, up to 40-­‐50lbs. Labor shortages, rising minimum wages and tightening labor laws are making it more difficult to process product quickly and efficiently. Hamer-Fischbein Robotic Palletizers are the solution to keeping your product flowing and your profits increasing while alleviating the pressures of maintaining manual labor. With numerous designs, we can find the right Hamer-Fischbein Robotic Palletizer for your product and your processing demands. 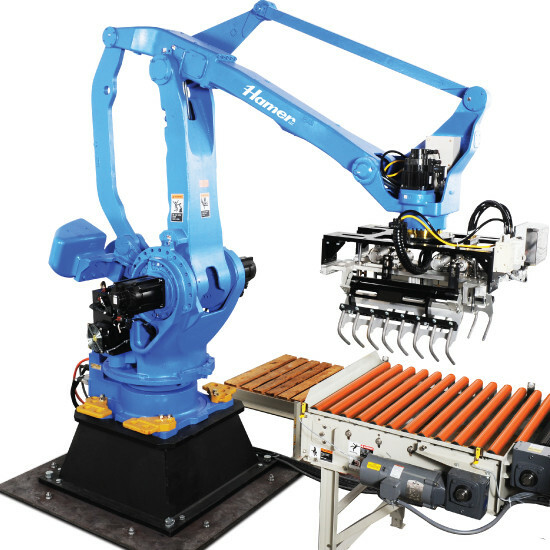 Hamer-Fischbein Robotic Palletizing Lines, Learn More! 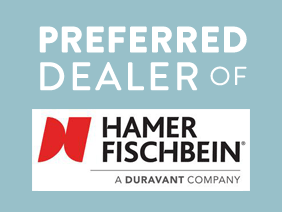 Have questions about any Hamer-Fischbein products? This printing system is suitable for many application contexts as it prints up to two lines with a print height from 5 to 60 mm (0.20″ x 2.37″). 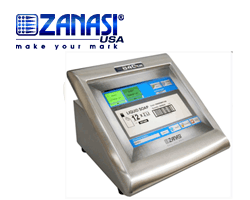 The z402, made by Zanasi, includes the technological excellences of the DOD range and Orkestra® innovation – a management software with customizable user interface for each operator. This system also features a purge and calibration per single nozzle; a message storage with file name; print parameters storage in the messages; and message dimension check before print. This printing system is suitable for many application contexts as it prints up to four lines with a character height from 0.8 to 12mm (0.032″ x 0.47″). 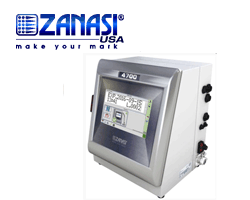 The z4700, made by Zanasi, is available in different configurations, depending on the application. It features management software; a 10.1″ color touchscreen and a simple and intuitive graphic editor. This system has a print rate of up to 2136ct/sec; a line speed capability of up to 400 mt/min (1320ft/min) and up to 4GB of storage with expandable micro SD memory. This printer features a double printhead that allows for simultaneous and independent coding on porous substrates on two separate printheads. 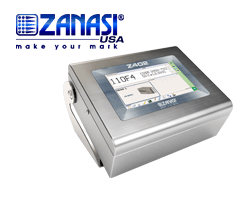 The Z640Plus 3.0, made by Zanasi, has a line speed capability of up to 90 mt/min (295ft/min) and uses Windows True Type fonts. Additional printing features include message storage space up to 50GB; can print high quality graphic images; automatic date, time, off sets and expiry date multifunctions; and has a repeat print message function.